For Chicago River Day 2018, Friends is putting the spotlight on the Monarch Butterfly, to educate more people about it's reliance on the river for habitat and ground our work by putting a face (a really cute one with attenas!) on why we do the work we do. · The monarch is one of about 100 species of butterflies found in the area, according to the Forest Preserves of Cook County. · Monarchs are the only butterfly known to make a two-way migration. They travel from Canada to Mexico, some nearly 3,000 miles, many following the Mississippi River, with the Illinois and Chicago Rivers important extensions of this essential flyway. Monarchs can travel up to 250 miles in a single day! · Monarchs rely on milkweed throughout their life. They lay their eggs on the plant, the caterpillars feed almost exclusively on milkweed and adults get their nutrients from the nectar. · Baby butterflies return to the same exact trees their parents roosted in before they were born. How they know which one is a mystery. · Males have a black spot at the center of each hind wing. The spot is a scent gland that helps the males attract female mates. 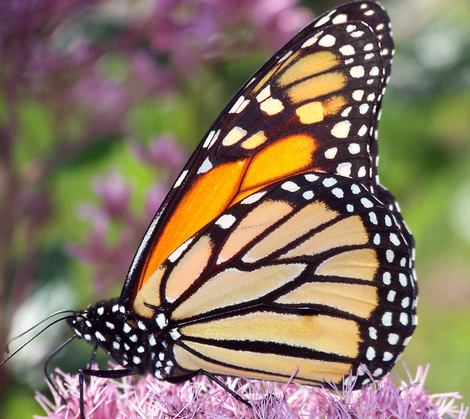 · In 1974, a third-grader suggested the monarch butterfly become the state insect, it was made official in 1975. · Their orange wings notify predators they are toxic to eat. · Monarchs smell with their antennas! · The monarch population has declined by more than 90 percent since the 1990s, according to the National Wildlife Federation. Climate change alters the timing of migration and rainfall patterns in their forest habitat. They're also facing habitat loss in the United States and Mexico. Milkweed, their main food source, is being reduced through pesticides.